It is hard not to want to personalize the wind that seemed to descend with pinpoint purpose on the Tree of the Hanging Squirrels in my neighbor's yard. Yesterday its not-really-vermillion (but I like the word "vermillion") leaves (it's a Japanese Maple) were there. Today the ruddy-reds are all but gone ... with the wind. The tree is all-but nekkid with the coming of a ground-zero wind that seemed to "do it on purpose." 1. I wonder what would happen if what happened in the second grade were fast forwarded to today. Back then, it was an occasional bit of tom-foolery for one student to put a literal thumb tack on another student's chair; for the victim to be victimized (ouch! ); and for life to move on without a backward glance. Everyone just sucked that one up. It was part of the second-grade agenda. Analysis or adult lectures were the furthest thing from anyone's mind: There was stuff that hurt in life and that's just the way things were -- even a kid (even the victim) knew that... joke or no joke. Making a touchy-feely federal case out of it was for nitwits. Today, of course, we'd probably need a TED-talk bit of psychoanalysis to squelch and explain and improve. Let's form another study group. Everyone deserves to be safe. Everyone wants to suppress the fact that life isn't safe ... and even a kid knows that. OK ... let's talk it to death. 2. My left index finger has an x-worth of three scars on the outermost phalanges. The scars bear witness to the fact that in the fourth-grade, the boarding school I was at did not frown on kids carrying knives. By knives, I mean sheath knives. I mean that over time more than one of the knives I owned reached from my belt line to the raw hide tie just above my right knee. I mean a knife ... not some dinky pen knife. 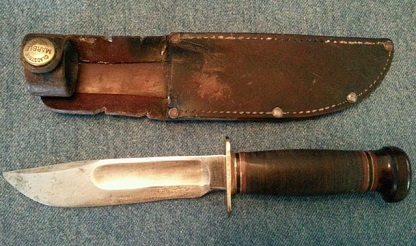 I carried more than one such sheath knife as the years passed -- a real knife. I carried it not least because bales of hay needed to be cut open during barn chores. Or maybe mumbletypeg. Or throwing it at a tree. But there were accidents and often I was the victim of my own accidents ... and hence the X of scars today. One of those scars, I believe but don't know, cut into a tendon. A slight lump remains together with the scars. That, like the tack on a seat, was the price of doing business ... the price of being alive. No one ever threatened anyone else with a knife that I knew of and I think every student would have been surprised if such an event occurred. Today, of course, we need to mull and discuss and make life safer for little Johnny or Sally. Oh yes -- girls carried sheath knives as well if they wanted to. No one blinked or looked askance. It was just the lay of the land. Accidents happen -- hell, life happens. Just mumbling and muttering and hanging the chads of no particular connection.